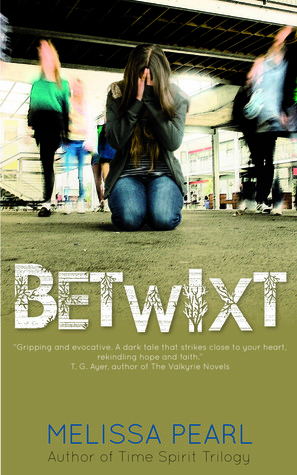 Thanks to AToMR Tours, we're spotlighting a brand new YA paranormal book, Betwixt, by Melissa Pearl. Keep scrolling to check out our review and then enter to win a copy for yourself! Betwixt is another book where the main characters all have secrets which are affecting the way they interact with everyone, and those secrets slowly trickle out over the course of the story. Nicole and Dale are two very different people -- Nicole runs with the popular crowd, while Dale only has a few friends. After Nicole is badly injured in a hit-and-run accident, her spirit remains in limbo between life and death, and for some reason, Dale is the only person who can hear her, and the only person who can help her. I liked watching Nicole grow as a person over the course of the book. Since no one can see her, and only Dale can hear her, she gets to learn the truth about a lot of the people who she thought were her friends, who aren't very concerned about the fact that she's suddenly gone missing. Only Dale, who she rudely dismissed to save face with her friends, is willing to do anything to find her. Nicole already knew her friends were no good, but seeing their reactions (or lack thereof) really helps her understand the kind of people she's been with. I saw another reviewer point out that the main theme of this book is second chances, which I think is absolutely true. Nicole (and her family) and Dale both are people who come to understand (or who already have experienced) the power of a second chance, and there are some pretty uplifting messages in this story once you strip away all of the defenses that Nicole was putting up to hide her secrets from everyone else. Nicole's a hard character to like at first, because you assume she's as mean as the rest of her friends, but as she slowly begins to realize that her life needs to change to be something more positive, she becomes easier to like. I thought Dale was a great character, too, the kind of guy that most people ignore or tease because he looks different (his face is badly scarred from an accident), but who despite it all is still a really sweet guy. Reading about his backstory really made me feel for him. He also easily could have been a caricature or someone played for a joke, but he came off as very real. This is a book which I honestly wasn't sure how it was going to end. It could have gone one of two ways, and I kept trying to predict what was happening next. It definitely kept me turning pages! Thank you so much for a wonderful review. I'm so glad you enjoyed the book and liked the complexity of the characters. I wanted Dale to be a non-typical hero and as his backstory developed, he became the perfect match for Nicole.